Running in Ljubljana, Slovenia. 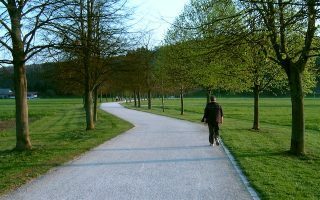 Best routes and places to run in Ljubljana. Ljubljana is the largest city in Slovenia, and has been the capital, cultural, and economic center of the country since it gained independence in 1991. This hilly city on the banks of the Ljubljanica River is an increasingly popular destination. Ljubljana presents a medley of cultures and architectures, due to its roots and history, from the Romans, as an Austrian city, an Italian occupied territory, and part of socialist Yugoslavia. Running in Ljubljana is a pleasure, given the relative proximity of wide, historic streets, parks, and river paths. Running actually seems more popular in than some other cities. Several local guides offer running tours of downtown, but it’s easy to explore the cobblestone streets of Old Town on your own. You can also get in mileage along the Ljubljanica river, which is lined with concrete paths, or you can explore the paved ways of Tivoli Park. For great views of town, head to the trails at Golovec Hill or Castle Hill, or survey part of the city perimeter on the 35 km Path of Remembrance and Comradeship. It’s easy to get around the small, pedestrian friendly center of Ljubljana, and most of our routes are within walking/running distance from the main tourist area. However, if you wish to travel further, there is a fairly extensive bus system throughout the city. Check out Ljubljana.info for information on special tourist rates. This 5.3 km 'runseeing' tour covers some of the city's most important highlights, from gorgeous buildings, museums, river bridges, and some more modern sections. Good add-on opportunities. The miles of concrete paths lining the banks of the Ljubljanica river offer a multitude of opportunities for running around Ljubljana. We've created a 4.3 km loop in Old Town area, and a 7.3 km loop further east, which is more pastoral. 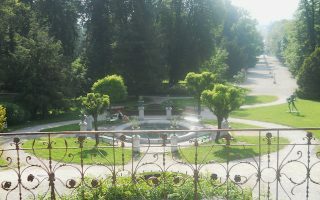 At 5 square kilometers, Tivoli Park is the largest park in Ljubljana — a refreshing sprawl of green space right in the city center. Locally known as the Trail Along the Wire or the POT, the Path of Remembrance and Comradeship is a 35-kilometer path marking where the city perimeter was fenced off during World War II occupation. Castle Hill is a wonderful 1.9 mile (3 km) history tour of medieval Ljubljana complete with challenging hill work. It is easily accessed from the city center. The climb is 557 feet over less than 1 mile, with grades up to 8%, but the views are rewarding! 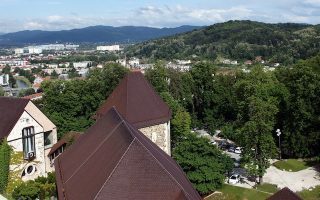 The Golovec Hill is the large mound to the southeast of downtown Ljubljana, home to several km of hilly, dirt trails looking back on the city. We've designed a 7.3 km loop, but there are other options for longer/shorter. Hilly. 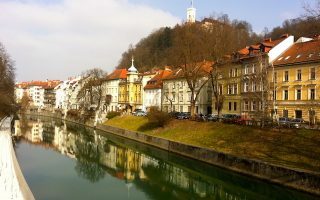 Ljubljana features a mix of climate types, with warm, Mediterranean type summers and cool to cold winters. Average summer high temperatures are in the low 80s (26C), though nights cool off. Spring and fall are mild and lovely. Average high temperatures in winter are just above freezing, with lows dipping into the 20s (-4C). Running in winter can feature some snow and ice. Note also that Ljubljana is one of the wetter cities in Europe, with an average of 55 inches (1,300 mm) of rain, with frequent thunderstorms in summer. 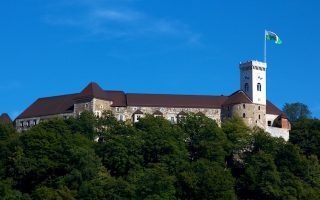 Go to VisitLjubljana.com for lodging info. The Radisson is especially helpful with route planing nearby! There are plenty of stores in Ljubljana where one can buy running gear. The primary ‘independent’ running store is Prorun, but it is not that centrally located. The best bet near the center is an Intersport store. See map on the city home page. Check Strava or Meetup for local running groups, or take a tour with Sightrunning Ljubljana. Check here for info on the Ljubljana Marathon and other upcoming races. The Ljubljana Marathon is in October.